Arsenal kept control of the destiny of the fourth and final Champions League spot as Lukas Podolski scored twice in an easy Premier League win at Hull. Arsenal stay a point clear of Everton - who beat Manchester United - but nearly conceded to a Shane Long effort. The Gunners took control as Santi Cazorla set up Aaron Ramsey to fire in and Podolski buried a half-volley. Podolski turned in a loose ball after the break and Hull never threatened to peg back their FA Cup final opponents. The two teams will meet again at Wembley on 17 May and Hull's fans began the afternoon by reminding their opponents of their 100% record at the venue, having won the 2008 Championship play-off final, and the recent FA Cup semi-final against Sheffield United. The Tigers will have to perform a lot better if they are to stifle a rejuvenated Arsenal in next month's encounter, though, and still have a faint threat of relegation hanging over them. Steve Bruce's side are six points above the drop zone but have three away games - at Fulham, Aston Villa and Manchester United - before finishing their league campaign at home to Champions League-chasing Everton. Arsenal will hope to finish their own season by not only securing fourth spot but repeating this victory to clinch their first silverware in nine years. Achieving those aims might be enough to persuade manager Arsene Wenger to extend a contract that expires at the end of the season. Played in blustery conditions which caused an early hold-up in play as advertising hoardings were blown across the pitch, and against opponents committed to pressing high and hard, this match had the potential to be a tough one for the Gunners. But apart from a couple of early opportunities for Hull, most notably when Long cleared the bar from a tight angle and Jake Livermore drilled against the post from distance, Arsenal looked secure. The visitors' opening goal arrived as Mesut Ozil, a peripheral figure on his first start in six weeks, fed Cazorla and the Spaniard poked a well-weighted pass through for a surging Ramsey to apply the finish. Ramsey only returned to action earlier this month after a thigh injury picked up on Boxing Day, and showed the attacking intelligence that Arsenal have often missed in his absence. With half-time looming referee Jonathan Moss ignored appeals for a foul as Nikica Jelavic went down in a challenge with Mikel Arteta, Arsenal swept upfield and Ramsey's chested lay-off gave Podolski the space to fire a crisp shot into the bottom corner. Nine minutes after the break, the German's second all but ended the game as a contest. Again Hull failed to shut down the space once Arsenal smuggled the ball through their first line of defence and Cazorla had time to look up at the byeline and pick out Ramsey on the edge of the box. Steve Harper could only parry the Welshman's first-time effort back out into the six-yard box and Podolski was first to the loose ball to notch his fifth in as many games. Arsenal could have had more. Olivier Giroud hit the bar after a misjudgement by Harper, Per Mertesacker nodded just over, and Ramsey brought a good save out of the Hull goalkeeper. Oddly, Arsenal's win makes Hull's qualification for Europe more likely. If Arsenal make the Champions League, they will no longer need the place in the Europa League which is reserved for the FA Cup winners. That spot would go to Hull - regardless of whether they are victorious in next month's Wembley showcase. Match ends, Hull City 0, Arsenal 3. Second Half ends, Hull City 0, Arsenal 3. Offside, Hull City. Curtis Davies tries a through ball, but Matty Fryatt is caught offside. Offside, Hull City. Stephen Quinn tries a through ball, but Matty Fryatt is caught offside. Attempt missed. Mathieu Flamini (Arsenal) right footed shot from the right side of the box is high and wide to the right. Assisted by Bacary Sagna. Corner, Hull City. Conceded by Per Mertesacker. Attempt saved. Matty Fryatt (Hull City) left footed shot from outside the box is saved in the bottom right corner. Assisted by David Meyler. Substitution, Arsenal. Yaya Sanogo replaces Lukas Podolski. Substitution, Hull City. Robert Koren replaces George Boyd. Corner, Hull City. Conceded by Wojciech Szczesny. Attempt saved. Tom Huddlestone (Hull City) left footed shot from outside the box is saved in the top right corner. Assisted by Stephen Quinn. Foul by Lukas Podolski (Arsenal). Stephen Quinn (Hull City) wins a free kick in the defensive half. Attempt saved. Aaron Ramsey (Arsenal) right footed shot from the right side of the box is saved in the centre of the goal. Assisted by Alex Oxlade-Chamberlain. Attempt missed. Per Mertesacker (Arsenal) header from the centre of the box is just a bit too high. Assisted by Santiago Cazorla with a cross following a set piece situation. Hand ball by Ahmed Elmohamady (Hull City). Substitution, Arsenal. Alex Oxlade-Chamberlain replaces Olivier Giroud. Substitution, Hull City. Stephen Quinn replaces Nikica Jelavic. Olivier Giroud (Arsenal) hits the bar with a left footed shot from the left side of the six yard box. Delay in match Olivier Giroud (Arsenal) because of an injury. Substitution, Arsenal. Mathieu Flamini replaces Mesut Özil. Corner, Hull City. Conceded by Laurent Koscielny. Attempt blocked. Nikica Jelavic (Hull City) header from a difficult angle on the left is blocked. Assisted by George Boyd with a cross. Attempt blocked. Nikica Jelavic (Hull City) right footed shot from the centre of the box is blocked. Goal! Hull City 0, Arsenal 3. 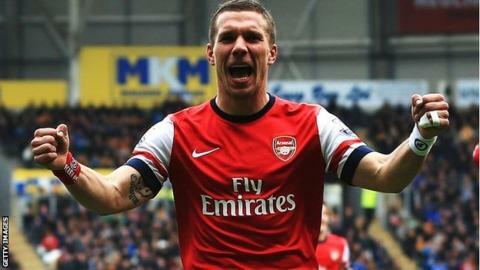 Lukas Podolski (Arsenal) left footed shot from the centre of the box to the centre of the goal. Attempt saved. Aaron Ramsey (Arsenal) right footed shot from the centre of the box is saved in the centre of the goal. Assisted by Santiago Cazorla. Matty Fryatt (Hull City) wins a free kick in the defensive half.